Don’t go looking for a gourmet treat. 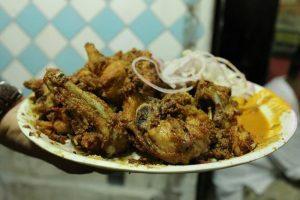 At Rs 100 per head, on a Daryaganj pavement just under the overhead footpath, Chicken Plaza won’t give you a five star meal, but you will have a surprisingly tasty snack at laughably low prices. Chicken Plaza is right by a tiny mosque, which makes it less than suitable for a peg and leg joint. Curiously though, the spice levels hit the roof. It is as over-seasoned as any peg and leg joint is. The menu is so tiny that they have not wasted time or money printing it out. 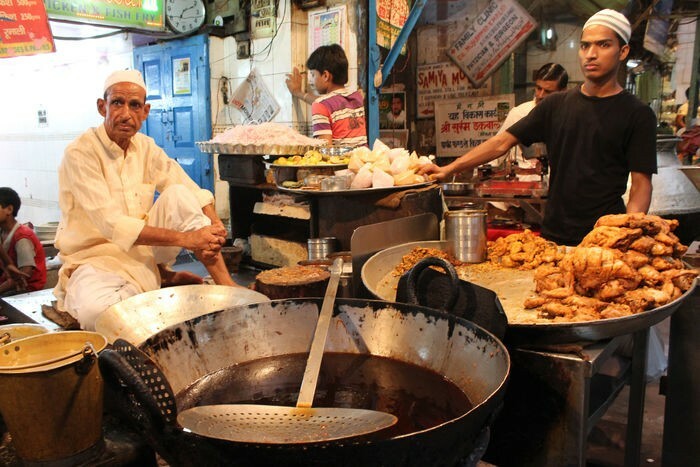 A boy comes to your table – in the evenings, tables and chairs are set out on the pavements – and sings out the menu. Fried chicken, chicken tikka, chicken qorma, mutton qorma, biryani. The only roti they serve is roomali rotis. Avoid the qormas like the plague. The mutton qorma tasted of really cheap oil, fried onion paste and not much else. The chicken qorma was not much better and I refused to touch the biryani. 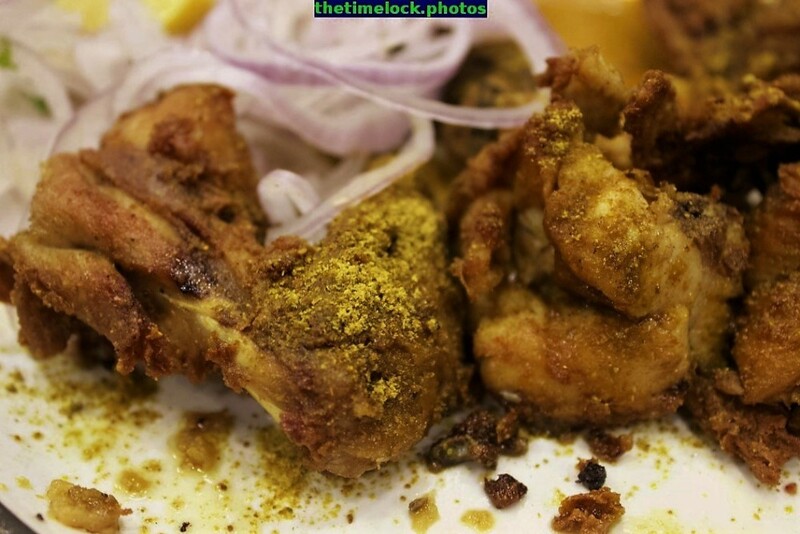 Each plate of qorma costs Rs 45 and comes with two pieces of mutton or chicken. Basically, the choice is between the Fried Chicken (Rs 40) and the Tikkas (Rs 50). The fried chicken is more or less the same recipe of what is available down the road in Urdu Bazar and Matia Mahal near Jama Masjid. Chickens are marinated with besan, salt and spices notably ajwain and gently fried. When you place your order, it is fried again. The result is a sort of crumb-like exterior, somewhat like an indigenous Kentucky Fried Chicken. The thin, watery chutney is sour and as digestive as it gets: the management wants you to eat as many plates as you can, after all! The chicken tikkas are a fluorescent red and are served swimming in the same tangy chutney. I’m not saying that they are not chaalu, but Rs 50 for about eight pieces is superb value for money in this day and age, especially as the little place is so conveniently located: you don’t even have to trudge to Jama Masjid. In the road just behind the Daryaganj main road, evening brings comfortable parking place – an important consideration hereabouts. You get cold drinks and pan right next door. Be aware though, that the management of Chicken Plaza will not provide you mineral water, even though it means a five step walk for them. It shows you just how unpretentious they are.